Moving the ball between the 20-yard lines in today’s NFL is one thing, but it becomes a different game inside the red zone, so it’s time to focus our rankings on that aspect of the game. There are many different ways to look at red zone numbers, but for the purposes of this article we are going to focus on touchdown efficiency – simply how often teams are getting to pay dirt when they hit the red zone. It’s important to understand this doesn’t necessarily rank the teams in terms of overall offense – there are some bad offenses who have been efficient in the red zone, and equally some good offense that have struggled more in that area. 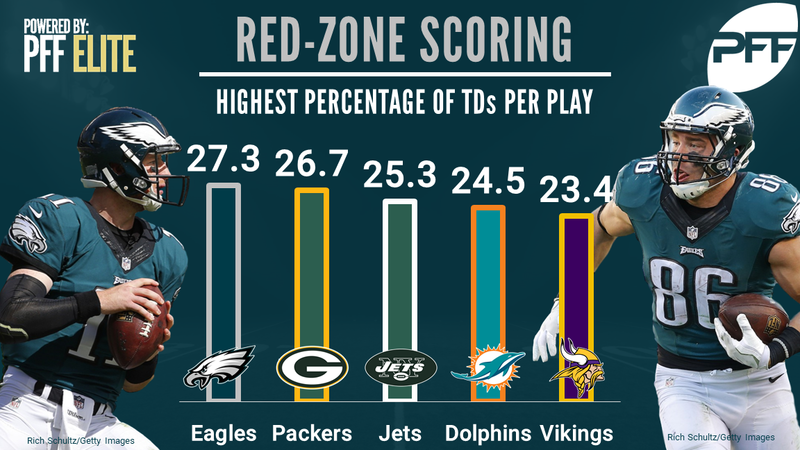 The Eagles are one of the game’s best offenses, so it’s no surprise to see them maintain those standards once they hit the red zone. Their heavy use of run/pass-option plays also gives them a boost that other teams don’t get. This season the Eagles have used 27 more of these plays than any other team, and it allows QB Carson Wentz to simplify his reads and stretch defenses schematically. They have been more prolific from a passing standpoint in the red zone, and no team as has many passing scores from inside the 20 this season. Much of this rests on the shoulders of Aaron Rodgers, who obviously is now down injured with a broken collar bone. Rodgers completed 21 of his 31 red zone passing attempts, and accounts for 11 of those 13 passing scores. Since coming in to replace him, Brett Hundley has a pair of passing scores in the red zone, but the majority of his big plays have come further away from the goal line. The Jets haven’t been the best offense in the world, but they have surprised a lot of people. No team has run fewer plays in the red zone this season, but part of that surprise has been how efficient they have been, scoring a touchdown on more than a quarter of their plays run inside the opponent’s 20-yard line. They have six rushing scores and six passing, with Josh McCown proving to be efficient inside the 20 as well as overall this season. The Miami Dolphins offense is pretty bad right now, and their biggest issue is getting down to the red zone at all. When they have got there this season though they have been one of the game’s most efficient teams at converting that field position into touchdowns, even if it has been 100 percent through the air. They are one of only two teams in the league not to have a rushing score inside the red zone, but they have put up twelve passing touchdowns from there. The Minnesota Vikings continue to be better than they were supposed to be on offense, with Case Keenum having a career-year throwing to arguably the league’s best wide receiver pairing in Stefon Diggs and Adam Thielen. Despite losing Dalvin Cook earlier in the year, the Vikings have still been able to generate a viable run game with Latavius Murray and Jerick McKinnon splitting the workload. Despite losing almost all of his wide receivers, Eli Manning has still been able to generate 11 passing touchdowns from the red zone, converting those opportunities into scores on 23.1 percent of the plays the Giants have run inside the 20. They have just one rushing touchdown in the red zone, and the heavy lifting has been done almost entirely by the passing game. Maintaining this efficiency will be tough over the second half of the season given the injuries that have racked up for this team. DeShaun Watson still accounts for all of Houston’s 13 passing touchdowns in the red zone, and the Houston offense really is two completely different units when he has played this season compared to when he has not. With him they were one of the league’s most efficient red zone offenses, but without him they have been as disastrous in the red zone as they have been overall. Tom Savage has now completed just two of his attempts inside the 20, to match the two he has completed to opposing defenders for interceptions. Nobody who watched the Saints game this past week will be surprised that they have been able to punch the ball in on the ground when they get close. With 12 rushing scores from inside the 20, they lead the league in red zone rushing scores on the ground, and the Dallas Cowboys is the only other franchise with more than ten. Drew Brees and the passing game has also accounted for nine scores through the air, with Brees himself taking credit for one of those rushing scores this past week against the Bills. The Dallas Cowboys offense is nothing if not balanced. They are one of only two teams to have ten or more rushing scores from inside the red zone, and the only one of those teams (New Orleans) to be able to match that total in passing scores. Dallas has been able to pass for a dozen touchdowns in the red zone thanks to Dak Prescott’s accuracy, while still leaning on that offensive line and their blocking for their ground game. Oakland’s offense has generally been something of a let down this season. On paper heading into the year they looked like one of the best units in the game, but it just hasn’t materialized, at least for any consistent length of time. They have at least been relatively efficient when it comes to scoring once they get inside the 20, with a rate that sits inside the top third of teams in the league. Only 11 scores from that area of the field though speaks to their issues getting there reliably. Jared Goff and the high-octane Rams offense has been a pretty good unit between the 20s, hitting scores from deep down the field, but they have also had more than their fair share of attempts in the red zone. They are one of just three teams to have 100-plus red zone plays, and they have converted those into 21 touchdowns, a dozen thrown by Jared Goff. Todd Gurley’s resurgence continues across the board, including down inside the 20. The Bucs offense has seen things muddied by the injury to Jameis Winston, and the return of Ryan Fitzpatrick and his Fitzmagic to the starting line up. They have a plethora of receiving weapons, so it’s no surprise that this team is unbalanced with far more of their red zone scores coming through the air than on the ground. They are at least more balanced in terms of attempts, with only five more passes than running plays when they are in the red zone. The Chiefs have been one of the league’s most explosive offenses at times this season, even if that has cooled off in recent weeks. A by-product of all of those big-play scores though is that they haven’t been in the red zone all that often by comparison. Only eight teams have run more plays inside the opponent’s red zone, with the Chiefs skewing heavily to the pass when they are down there, though some of that is skewed by their shovel pass plays to the likes of Travis Kelce, that are recorded as passing plays but are effectively just forward handoffs surrounding run blocking schemes. Kirk Cousins and the Washington offense has been a solid unit in the red zone, and they may get even better as Josh Doctson continues to emerge within that offense and develop a better chemistry with his quarterback. The Redskins have been a balanced red zone offense, with just one fewer rushing attempt than they have passing plays, and that is reflected by seven rushing scores compared to nine through the air. The Carolina Panthers offense has the potential to be a true nightmare to defend, but Cam Newton has blown hot and cold this season, while their use of rookies Christian McCaffrey and Curtis Samuel has yet to reach peak creativity. They are one of the few teams in the league to have run more down inside the 20 than they have passed – which fits their offense – and it has resulted in an equal distribution of scores between rushing and passing. The Chargers have visited the red zone less than almost any other team this season. Only five teams have run fewer plays from there than the Chargers, but they have still come away with 11 scores, eight of them coming through the air. As you might expect from a quarterback of his experience, Philip Rivers has taken just one sack in the red zone this season. Another team that has changed quarterbacks, and thus changed their offense, during this season, the Chicago Bears have been in the red zone fewer than all but four other teams. When they have been there, they have been a pretty balanced offense, rushing the ball five fewer times than they have passed it, and scored five times on the ground and through the air. Atlanta’s high-octane offense from a season ago feels like it’s just been running a little rough this year. All of the pieces are still there, but it’s not quite firing on all cylinders. They have run more plays inside the red zone than all but six other teams, but they haven’t quite been as efficient as you might expect, with Julio Jones in particular unable to bring in those scores. He has just one receiving touchdown in the red zone, and that one he had to work miracles to rip the ball away from Patriots CB Malcolm Butler to secure. Tennessee’s offense is a run heavy unit anyway, but that goes even more pronounced once they hit the red zone. They have run the ball seven more times from inside the opponent’s 20 yard line than they have passed, and that has resulted in more than twice the number of scores on the ground than they have been able to put up through the air. The Bills have just benched quarterback Tyrod Taylor in an attempt to spark some life into a team that was surprisingly in the hunt early in the season. They have been a run-heavy team when they have got down to the red zone, handing it off four more times than they have passed, but Taylor is one of just two quarterbacks in the league not to have been sacked in the red zone. Seattle’s offense at times makes magic happen given how bad their blocking can be up front. Russell Wilson has been able to produce 14 passing touchdowns, tied with the Patriots for second-most in the league, despite being in the red zone on 51 fewer plays. The Seahawks have been 100 percent reliant on Wilson though, as they are one of two teams with no rushing scores inside the 20. Cleveland’s offense has been a rollercoaster this season with rookie DeShone Kizer under center most of the time, but other quarterbacks seeing the field at times once Kizer was sat down or injured. They have tried to take the ball out of his hands when they have hit the red zone, running the ball eight more times than they have put it in the air, resulting in two more rushing touchdowns. Given their offense it’s no surprise to learn that no team has run as many plays in the red zone as the New England Patriots, but it’s perhaps more surprising to see how relatively inefficient they have been at converting those into touchdowns. 14 passing scores is second in the league, while seven rushing touchdowns is tied for seventh, but this team has run 17 more plays from the red zone than any other side in the NFL. The Cincinnati Bengals have had their fair share of offensive woes this season, with the team struggling on the offensive line and with Andy Dalton unable to play at his best because of it. The loss of Tyler Eifert obviously has a major effect on their red zone efficiency, even if Tyler Kroft has been doing an admirable job filling that void this time. They have run exactly as many passing plays as rushing plays when in red zone situations. The Jaguars have been trying to take the ball out of the hands of quarterback Blake Bortles for much of the season, but that causes problems down inside the 20 where teams are able to play closer to the line of scrimmage and tighten up the running room. This team has run significantly more often than they have passed, but they have scored just five rushing touchdowns compared to nine through the air. Arizona has been hampered by one of the worse offensive lines in the game, and that really limits their ability to just pound the ball in when the field gets condensed. They have passed the ball significantly more when they get there than they have run, but a down field passing attack has its own issues on a short field. One area that will be of concern for a Lions team that wants to continue to surprise and win games is their red zone inefficiency. They have leaned heavily on the passing game in the red zone and come away with nine passing touchdowns from those opportunities, but here is where their lack of a consistent run game hurts. Pittsburgh’s offensive weapons makes this number one of the most shocking in the list. The Steelers have the weaponry to be the best offense in the game, but continue to struggle in 2017, and nowhere more than when the field gets compressed and they need to execute better. Only five teams have run more plays from the red zone than the Steelers. The Baltimore Ravens have been all over the map this season on both sides of the ball, but one thing they have been pretty consistent in is their inability to convert red zone chances into scores. They have 12 total red zone touchdowns, but they have been in that area of the field the ninth-most. The San Francisco 49ers have actually been able to move the ball reasonably well this season, but have struggled converting once the field gets compressed inside the 20. They have run the ninth-most plays from the red zone this season, but have just four passing scores to show for it, even if their eight rushing touchdowns shares a tie for fifth in the league. No Andrew Luck for the Colts was always going to lead to a miserable season of offense, and while Jacoby Brissett continues to flash enough good play to remain an intriguing quarterback for the future, his play manifests itself in flashes rather than consistent efficiency. Nowhere does that distinction become more important than inside the red zone, where the Colts have only been able to find three passing touchdowns despite ten times that many passing plays. No QB has been sacked more in the red zone than the seven times Brissett has gone down. The Denver Broncos offensive woes summed up with a single statistic this season. Even when the team has been able to move the ball well, they have stalled once they get close to paydirt. Only three teams have run more plays from the opponent’s red zone, but they have converted all of those into a score at the lowest rate of any team in the NFL. Trevor Siemian flashed improvement in the first couple of games, but then his play fell off a cliff, with former Peyton Manning stand-in Brock Osweiler now back under center and doing little to bolster this number.